Special Containment Procedures: SCP-1497 is currently contained inside a secure locker within Site-██. Eye contact with SCP-1497 is to be avoided. Instances of SCP-1497-1 created outside of testing are to be given Class A amnestics. 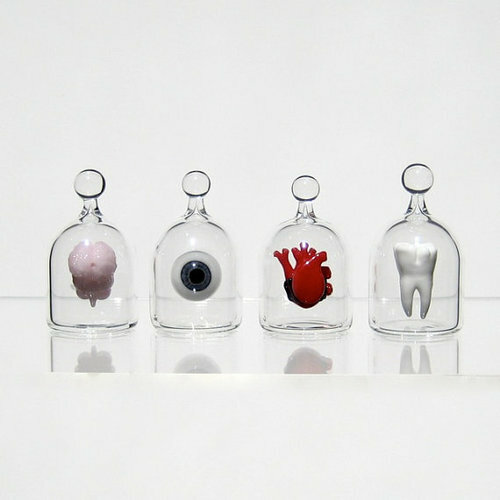 Description: SCP-1497 is a miniature human eye suspended in the center of a 6cm tall glass jar, though it is unknown how this suspension is achieved as SCP-1497 cannot be opened. SCP-1497 lacks an optical nerve and retinal blood vessels, as the sclera completely covers the entire surface save for the cornea. The eye is capable of freely rotating on all three axes, and regularly does so in the direction of new visual stimuli. The iris of SCP-1497 changes color upon maintaining eye contact with a human for three seconds, matching the color of the viewer's eyes. This activates the cognitohazardous property of SCP-1497. Upon activation, the human that SCP-1497 mimics (henceforth SCP-1497-1) begins experiencing a shift in visual perception. Instances of SCP-1497-1 have reported that things they previously found visually displeasing became much more visibly appealing. This has been confirmed to not be the result of hallucinations, but rather a cognitive shift within SCP-1497-1. The most common effects are an increase in perceived attractiveness of other humans, resulting in an increase in sexual attraction, and increased appreciation of all visually artistic exploits. The effect of SCP-1497 also extends to concepts and situations, as SCP-1497-1 is unable to visually recognize a threat. When presented with blades and firearms, SCP-1497-1 will only be able to appreciate the aesthetic design of the weapon even when presented in a threatening manner. Testing concluded SCP-1497-1 will not react to threats of violence to itself or others, and are equally unaffected by witnessing violence against others. However, SCP-1497-1 are able to recognize when they are being harmed, although they are unable to visually recognize the cause of the damage. This sends injured SCP-1497-1 into a panic state that often causes them to be unable to respond to the act of violence, though they are capable of fleeing and seeking medical attention. Due to similar anomalous properties between SCP-1497 and SCP-1528, investigation into possible connections is currently under consideration. SCP-1497 was located in an art gallery in Portland, Oregon on 03/02/2013 by an agent implanted in the local police force after receiving reports of someone calling for help within the locked building. SCP-1497 was located on a pedestal with a note and photo (See Addendum 1497-A) under it, the plaque on the pedestal reading "Better Off Blind Than Beguiled by Beauty." Trapped within the art gallery were ten blind humans, all of whom claimed they had been kidnapped within the past week. Class C amnestics were distributed among them after questioning and they were returned to their places of residence. Addendum 1497-A: The following note and photograph were found pinned under SCP-1497. A written message on the opposite side reads "Other pieces in the Perfection Series"
On 11/04/2013, Foundation security personnel raided a warehouse belonging to Kappel Securities GmbH, a multinational financial firm specializing in assets related to private art collections. As expected by Site-██ intelligence analysts, items suspected to be related to SCP-1497 per Addendum 1497-A were present and seized by personnel. Three items were given provisional classifications [TAO-8211G, TAO-2167R, and TAO-5999I] and routed to Site-██ for classification. These items, referred to in recovered documentation as the "Perfection Series," were intended for display at a private showing, scheduled to take place at a residence in Saint Petersburg, Russia. Subsequent investigation identified several Persons of Interest believed to be responsible at least in part for SCP-1497, leading to the capture of POI 2-S TG473, a plastination specialist in Eindhoven, Netherlands. After initial processing and detainment, researchers recorded the following intake statement from POI 2-S TG473. Research staff confirmed veracity of details of the following statement, and subject was treated with amnestics and released after 15 days. Agent Navarro: Please state your name for the record. POI 2-S TG473: █████ ████████, resident of Geldrop-Mierlo, Netherlands. You'll find my paperwork in order, surely. No one's told me what's going on, what is this place? Agent Navarro: You're at the Aarhus bureau outpost of Interpol. We just have a few questions related to an ongoing investigation. We have no plans to turn you over for criminal charges, Mr. ████████. We would just like to understand a little more about this item [Agent Navarro hands a photograph of SCP-1497 to POI 2-S TG473]. POI 2-S TG473: Oh. That. Agent Navarro: So you're familiar with this? POI 2-S TG473: Yes. May I…may I smoke in this room? POI 2-S TG473: [Subject takes cigarette from package and commences smoking] I thank you. As you're doubtless aware by now, I am by profession a purveyor of anatomical models and medical teaching aids. Laboratory skeletons, preserved organs from patients who have died of rare diseases, things of that nature. Mostly mail order service to universities in the EU and Russia. Agent Navarro: Any work on the side? POI 2-S TG473: [Subject exhales deeply] …you certainly do your research at Interpol. Yes, I have fulfilled requests on occasion for…how do you say, private, materials. You are familiar, of course, with those distasteful traveling exhibits with the "educational" displays of cadavers and such. Cheap leering. Feh. Of course, certain individuals, they want private exhibits of such things. It's some sort of fad among the newly-wealthy, apparently. Sometimes they make arrangements in advance for, what do they call it, a "memorial". God, what a tacky term. Sometimes I'm brought a "friend" or a "loved one". And I preserve them, mounted like some cheap hunting trophy, skinless while riding a bicycle, half of them hanging from a ceiling, other silly ghoulishness. Agent Navarro: Why do they come to you? POI 2-S TG473: [subject shrugs] Recommendations, I suppose. You preserve one Russian tycoon's circulatory system wearing a top hat, the rest come calling. Business is business. Agent Navarro: So, the object in question. POI 2-S TG473: Yes, that. I receive a phone call one night, telling me to expect some business. I received the call on my private cell phone, so it is of course an assignment of the nature we have just discussed. My contact tells me to expect an "unusual" client. If one were to ask me, anyone seeking these services is unusual, but I digress. I am told to be at my laboratory at midnight that evening to discuss the terms. This clientele is prone to unnecessary dramatics, so of course I think nothing of it. I arrive at the appointed hour, and I am met by a group of three men with a small suitcase. But these men, they aren't the types of people that I am used to seeing for this sort of arrangement. These were…not transients, but all three of them wore tattered clothes, kept long, matted, gray beards, and their faces, what little I could see of them that were not obscured by beards, seemed to covered in…soot, of some kind. Before I had time to be angry at being pulled away from my bed at an ungodly hour for a childish prank, one of the men hands me the suitcase. Agent Navarro: Did any of the three men identify themselves? POI 2-S TG473: No, and I did not ask. Force of habit. Agent Navarro: Do you need some time to collect your thoughts? POI 2-S TG473: …forgive me, I…it gets rather strange from there. Agent Navarro: I hear that a lot. Please continue, we're just interested in what you have to say. POI 2-S TG473: I open the briefcase, and inside is a miniature…man, of sorts. Perfectly proportioned, looks to be about thirty or so, long hair, beard and such. But he can't be more than a half a meter or so. I have seen dwarfism, but never anything like that. It was strange enough that I had forgotten about the gentleman pointing the pistol at me. The man directly in front of me was direct. They wanted…parts, of this, thing, preserved. And they wanted it tonight. They were willing to compensate me quite handsomely, but my participation was not up for discussion. Agent Navarro: What parts were they talking about? POI 2-S TG473: They wanted the left eye, the heart, a rear molar, and its brain. Simplicity itself, really, when you don't consider that a gun is being pointed at you and the specimen is something from a sideshow. I immediately set to work. I did not at the time stop to wonder why three vagrants would be in possession of thousands of euros and a tiny man, and honestly I have not stopped to think about it too thoroughly since. There was a problem, though. POI 2-S TG473: Yes, the foul abomination wasn't dead yet. I made the initial incisions to remove the eye, and it started shivering. Gods, it gives me goosebumps just thinking about that. The man who had done all the talking assured me that the thing wasn't alive in any real sense, and the man with the pistol encouraged me to continue. Continue I did, then, first removing the eye, then the heart. Despite assurances to the contrary, these things should not be beating when I receive them for preservation. All the while, this…thing, didn't bleed at all, but it trembled throughout. I feel sick all of a sudden. Agent Navarro: Would you like to continue later? POI 2-S TG473: …no, no, I should be fine. Anyway. I had problems when it came to the teeth. You wouldn't think of this, but removing the teeth from a tiny man is not a particularly easy task. They kept breaking. Every time, I use my finest pliers, then *plink* they break apart right as I'm about to get them out. The heightened nerves that come from doing such delicate work at gunpoint were not helpful for my labors. Fortunately, I was able to devise something of a solution that was acceptable to my clients, involving grinding up the remaining teeth and mixing the resulting slurry with some ceramic and…well, details bore outsiders, I know. Suffice to say that I ended affairs by scooping out its brain and pumping the tissue full of preservatives as fast as I could manage. Several hours later, all of the…materials, were done curing. The three gentlemen produced four glass jars, full of surprises as they were. They placed the preserved bits of their small acquaintance in the jars, and without a word exited, leaving behind the hundred thousand and the somewhat worse-for-wear remains of the little…thing. Do you happen to have any cognac on premises here? Agent Navarro: What happened next? POI 2-S TG473: Strangely, the profitable night left me feeling less than jubilant. It was almost dawn, I was quite tired, confused, and to be frank, frightened. I pondered the nights events, when the remains of the little man started…I'm not sure how to say…moaning? It was likely moaning. I decided that my work day was at an end then and there, and I pitched the little man into my incinerator, turned it up high, shut the door and plugged my ears. Agent Navarro: Just…into the incinerator, like that? POI 2-S TG473: Yes. Just like that. What would you have recommended? Agent Navarro: That will be all, Mr. ████████.